There is a bit of a romantic fantasy about what it must have been like for the pioneers who traveled out west more than a hundred years ago. The idea of land that stretches on for miles without a single building or road was both exciting and frightening to them. However, they had the skills they needed to fend for themselves without the conveniences of big cities. If a major collapse happens, it will be the people with those kinds of skills who make it. If we ever find ourselves in a world that resembles the pioneer days (no electricity, no running water, etc. ), people will have to learn how to cook all over again. Cooking over a fire is a lot different than cooking in the microwave or on an electric stove. Certain meals and recipes are going to require a little tweaking. Back in the pioneer days, their recipes were very simple. They didn’t have specialty grocery stores filled with hard-to-find ingredients or things that didn’t store well. They had pantry items and prepared everything from scratch. The lucky pioneers had access to fresh milk and eggs. The unlucky did without. Pioneers relied a great deal on Dutch ovens to cook their meals on the trail. Recipes didn’t involve specific temperatures. Rather, it was just a patter of putting ingredients into the Dutch oven and letting it cook over a fire. In this article I’m going to share some simple recipes from those days. You may want to familiarize yourself with these recipes so you can cook meals when there isn’t any electricity and you only have the ingredients you’ve been stockpiling. Keep in mind, the staples in a pioneer diet are a bit different than they are for us today. Quick and easy and can be eaten alone or dipped in a little grease for flavor. Dipping the biscuits in syrup is also a way to add a little sweetness to a breakfast meal. Pour the flour in a bowl and slowly add one tablespoon of milk at a time to form a stiff dough. In a small dish, dissolve the baking soda in about a tablespoon of milk. Mix it into the dough. Add salt and mix again. Roll out the dough until it is nice and thin. Cut circles out of the dough. Cook in a Dutch oven or standard oven until the sides are brown and the biscuits are no longer doughy. Easy breakfast that will stick to the ribs and keep everyone full until the midday meal. Put the currants in the boiling water and let cook for a few minutes. Add in the cornmeal and keep stirring to keep it from clumping. Add in the lard and salt and continue to stir for about three minutes. Remove from heat and serve immediately. You can add butter and molasses for flavor. These are essentially round bits of cornbread that can be eaten on the move or served with stew or chili. Get your Dutch oven nice and hot, and use a saucepan to cook cornmeal, butter, salt, sugar, and milk. Remove from heat and let sit about five minutes. Mix in the baking powder. Use a tablespoon to drop spoonfuls of the mix into the Dutch oven. Cook for about 10 to 15 minutes or until the edges are brown. A take on the standard pancake, but made with cornmeal for a fluffy, filling addition to a soup or stew. Mix dry ingredients and then add in the milk and molasses. Eggs can be added to make the Johnnycake a little fluffier. Pour batter into a greased 9” pan and cook over high heat for about 20 minutes. Rice with some sweet flavoring can be served as breakfast, dessert or dinner. The amount of rice you cook will depend on the number of people you are feeding. Put the rice in a Dutch oven and add in the rest of the ingredients to taste. Heat until the eggs are cooked thoroughly. Gravy can be poured over soda biscuits, potatoes or even cornbread to help make a meal a little heartier and flavorful. Heat grease and add jerky until it is nice and crispy. Remove the chunks of jerky. In a small bowl, combine the milk and flour to form a paste. Pour the paste into the grease and slowly stir until smooth. Add back in the jerky bits and season to taste. This isn’t something you cook, but without refrigeration, salting meat was the only way to really preserve it. The corned beef can then be used in a variety of recipes. Combine the salt and remaining ingredients in a small bowl. Rub the mixture into the beef. Allow the meat to sit for 10 days, making sure to turn the meat daily. Some of these recipes will take practice. You’ll have to be familiar with your Dutch oven, cook things slightly longer or shorter, and increase or decrease ingredients to improve the taste. 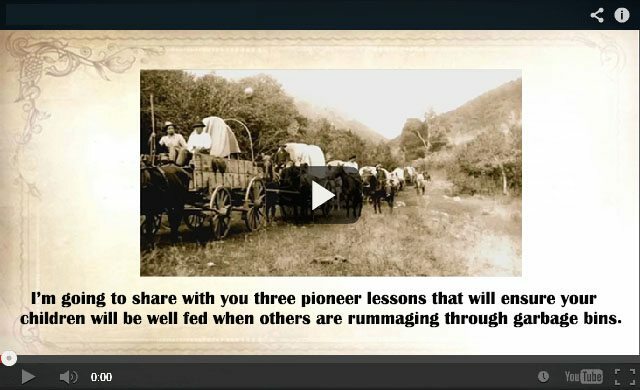 If you want to learn more about pioneer skills and recipes, watch the video below. I was thinking the same thing. Even if I wasn’t allergic to milk, where would we get it and how could we store it? surviving the next Zombie attack will involve a lot more than knowing how to cook. there are so many things one can learn just from knowing the basics. The food you have on hand will not last long. you need to gather from other resources. If you have a gun and ammunition that’s a start. a little .22 rifle will bring in lots of food and ammo will not take up a lot of space or cost you an arm and a leg. If you play the guitar this is nice, the strings make a great snare for small game such as rabbits and even squirrels. A small bow saw will cut wood for fires to keep warm and to cook food over. Be sure to keep some fishing line and a few hooks in your kit too. In the dead of winter if you are forced outside a place to sleep will be had to find. Push leaves in a pile to sleep on a 4″ layer will keep the cold off and then cover your self with more leaves and pine needles. Nuts of all kinds will take the place of protein. even acorns roasted are good to eat. Larger game such as deer will provide days of meals find a culvert and string wire and hang the meat on the down side of the wind burn wood such as oak to smoke the meat. Chicken wire will keep critters away from it. In warm months fruit and berries will fill your stomach. as far as drinking water keep a few large bottles of bleach on hand. a gallon of water can be treated with by boiling for 3-5 minutes then add 1/2 teaspoon of bleach. here I go, giving a preview of my next book. happy survival. Pioneers – or Settlers – were in fact SURVIVALIST’s. They fine tuned the lifestyle they lived daily and sorted out the glitches, problems and foreseeable events which might, if not prepared to face, would cause them death, destruction and ruination. This required knowledge and paying attention to those who had already blazed a trail previously. However – there were no guarantees. Women and children died frequently. Men and boys too died or were seriously hurt or crippled. It was a rough haul and danger lurked everywhere if ALL weren’t paying heed and supporting one another. Knowing and Borrowing from history and handed down accounts regarding the pioneering settlers lives we can today prepare to face increadable odds against us. We currently don’t have to face hostile Native American Tribes or Mexican Commenchero Bandits. But we face a different enemy of the PREPPER Survivalist – The Deaded Unknown ZOMBIE forces which could be Thugs, Waring gangs, Pyschopaths, Sociopaths,City and Urban savage roving gangs, an Enemy Army, our own militiary forces, a new deadly fascist government or the Vampiric Clintons. Luckily for us, we can also access the world’s best military’s and their training information, weapons, equipment and supply surplusage. While a Sharps Rolling Block Long Barrel Rifle would drop a buffalo or an whopping Indian on horseback at 500 yards in 1850, isn’t nice that we get to chose from a miriad of modern weapons that surpass the Sharps old school technical achievent. There is a weapon to suit every person for whatever purpose today. And they’re affordable. For now. Also while this particular article about Pioneering Cooking on the trail or home cooking and the seven recipes therein – I’d behoove the prepper to learn everything about minimalist cooking and preserving and canning. MRE’s are not meant to survive on for a long duration. Freeze Dried -Dehydrated foods also are not meant to be eaten in perpetutiy. Bush meat cooked over a firepit is an option – but real homestyle cooking using supplies from a well planned and equally well supplied pantry, is what homelife is all about isn’t it. Today we over-eat – and what we eat is unhealthy and loaded with toxic chemicals and non food fillers, flavor enhancers and preservatives. Nearly everything is hallow calories consisting of fats, sugars and salt. The food we eat today, would make a Pioneer family vetch and gag and they most likely would immediately spit it out and issue some epithet. Can’t say that I would blame one bit. I mean, come on now, a HOT POCKET or a Triple Big Mack, Fries and a Shake? Might as well eat right out of garbage can. Learn to cook well… and learn how to cook the way out forefathers and great grandmothers did. You can do it.